Aditya Degree College, Kakinada has advertised in THE EENADU newspaper for recruitment of Lecturers jobs vacancies. Interested and eligible job aspirants are requested to attend interview on 31.05.2018.Check out further more details below. 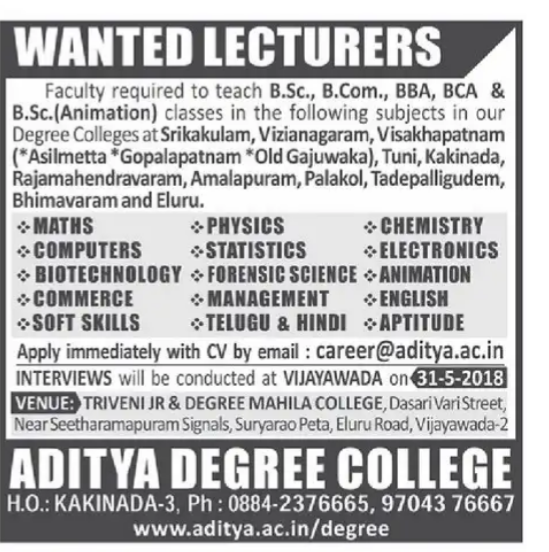 Name of the College : Aditya Degree College, Kakinada. About College:Aditya Degree colleges are the precious gifts presented to the twin Godavari Districts by ADITYA. Educational group ADITYA Degree College which was established in 1998 in Kakinada fulfilled the hopes and aspirations of many graduates and had been acclaimed as the best degree college under Andhra University. Encouraged by the 100% result in 2003,ADITYA added several feathers to its cap by launching Degree Colleges in Rajahmundry in 2003, in Vizag and Palakol in 2005 and in Tatipaka in 2006. Retired persons with Ph.D Qualification and Freshers can also apply. Venue:Triveni Jr Degree Mahila College, eluru Rd, Vijayawada.